Spec The Halls – What We’ve Raised So Far … and it’s not too late to get your copy! While the last day for entering the Spec The Halls contest is today (it’s midnight-ish tonight, even though judging is already underway), it’s not too late to get the charity eBook! Roughly speaking, we’re talking about the last week in November through the last week of January. And that’s how long the eBook will be available.1 You can get your copy at directly from us (use this for reading in iBooks or for the PDF version, and import the ePub format), Amazon, and Barnes & Noble. All the proceeds will be going to Heifer International. And if you’ve already donated directly to them, send me a copy of the receipt, and I’ll get you the eBook! 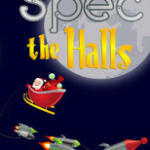 Buy a copy of Spec The Halls using the links above or at the website today! 1 Besides, we’re still in the Twelve Days of Christmas! 2 Because if there is an apocalypse this year, you won’t need that cash anyway, right?